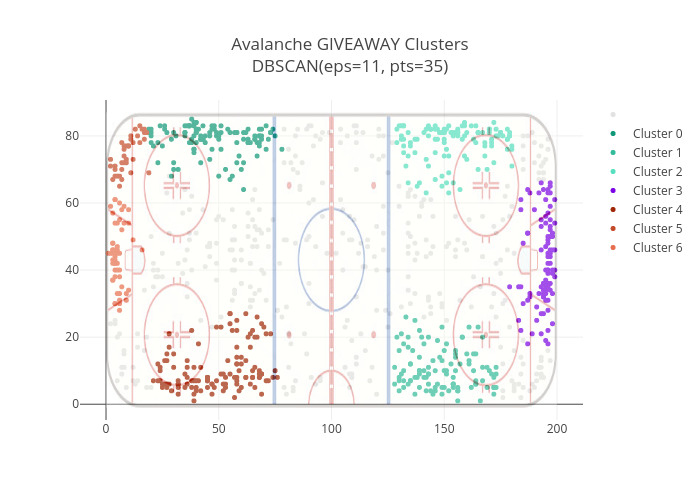 Dtemkin's interactive graph and data of "Avalanche GIVEAWAY ClustersDBSCAN(eps=11, pts=35)" is a scatter chart, showing , Cluster 0, Cluster 1, Cluster 2, Cluster 3, Cluster 4, Cluster 5, Cluster 6. The x-axis shows values from -12.642706131078226 to 212.64270613107823. The y-axis shows values from -4.371090448013526 to 90.37109044801353.